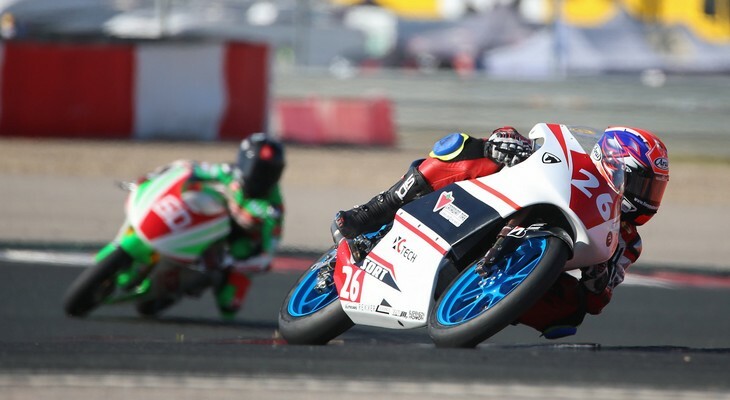 Canadian Jonathan Finn’s PreMoto3 weekend at Circuito de Navarra tested his fortitude to find the confidence that he needed in his bike. A tenth-place finish was his reward for overcoming a variety of set backs this past weekend. Finn picked up right where the previous weekend’s testing finished during Thursday’s Free Practice Sessions with laps times improving each time he took to the 3.9 km long Circuit de Navarra. Something changed during Friday’s Free Practice Sessions and Finn struggled to maintain the pace he established during the previous day’s sessions. He was able to improve slightly by the final session and set a personal best time which was the sole silver lining for an otherwise tough day. Saturday’s first of the two qualifying sessions started with a mechanical issue that ate into precious track time. He was able to improve during second qualifying session and set another Personal Best time, but it would place him outside the top-tan forcing him to start 12th on the grid. Finn still struggled with the overall pace throughout the race but fought hard for positions just inside the top-ten. He was able to rebound from a challenging weekend with tight battle right to the line earning him a 10th place finish, just shy of ninth place by 4/10th of a second. Finn will be residing in Valencia Spain to concentrate on his training and to prepare for the remainder of the season. The RFME Campeonato de España Cetelem de Velocidad Championship travels to Motorland Aragon Circuito July 12-15. Motorland Aragon Circuit is located 250km west of Barcelona.